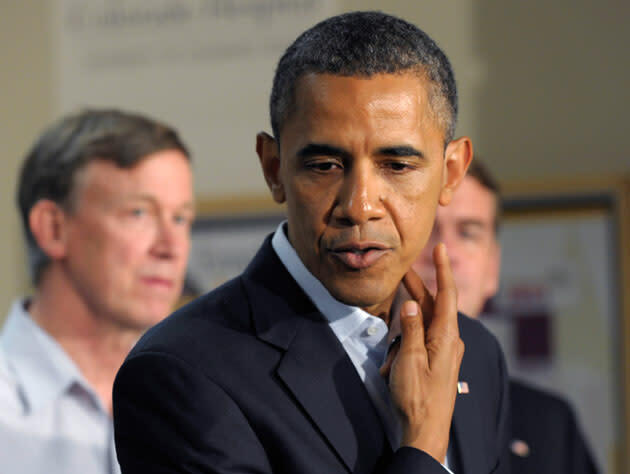 AURORA, Colo.--President Obama emerged from University Hospital here Sunday evening with a story of survival which he said should inspire everyone to focus on the miracles from Friday's mass shooting at a movie theater. After three hours of private visits with the shooting victims and their families, Obama said his last stop in the hospital was with Allie Young, a 19-year-old woman who had been shot in the neck. She survived the attack because her 21-year-old friend, Stephanie Davies, laid by her side and applied pressure to her wound while the gunman continued his rampage. "Allie told Stephanie she needed to run. Stephanie refused to go--instead, actually, with her other hand, called 911 on her cell phone," the president said. "Because of Stephanie's timely actions, I just had a conversation with Allie downstairs, and she is going to be fine." "As tragic as the circumstances of what we've seen today are, as heartbreaking as it is for the families, it's worth us spending most of our time reflecting on young Americans like Allie and Stephanie, because they represent what's best in us, and they assure us that out of this darkness a brighter day is going to come," Obama said. Obama said many hugs were shared and tears shed on Sunday. "I come to them not so much as president but as a father and a husband," Obama said. "I confessed to them that words are always inadequate in these kinds of situations, but that my main task was to serve as a representative of the entire country and let them know that we are thinking about them at this moment and will continue to think about them each and every day." He said he encouraged the people he met on Sunday not to dwell on the evil caused by suspected gunman James Holmes. "In the end, after he has felt the full force of our justice system, what will be remembered are the good people who were impacted by this tragedy," Obama said.